Tenants! Be the best that you can be! gaining employment, adopting a healthy lifestyle, getting a qualification or contributing to their local community. A healthy lifestyle? The future of your tenancy relies on your ‘salad and brisk walk’ score? The ‘5-a-day’ tenancy condition? The tenant’s performance against the ambition agreement will apparently be a factor in assessing whether a further tenancy will be granted at the end of the fixed term. If they decide that they do not want to take advantage of this opportunity [sic], they will be advised to bid for homes offered by other housing providers who do not have a similar scheme. everyone entering this with us to do the very best that they are able. Tenants are to be the very best that they can be! And eat more fruit! This is tenancy management by way of motivational poster come passive aggressive post it note stuck to the fridge. It does not appear to have occurred to Yarlington that some prospective tenants might not need or want to have ambitions or aspirations beyond what they already have. All must aspire, regardless. It might well be that some tenants might have ambitions and aspirations that Yarlington don’t think should count. Who gets to determine the terms of the agreement? I suspect we can guess the answer. It also doesn’t appear to have occurred to Yarlington that, well, stuff happens. People suffer life crises, relationship breakdown, major health issues and all the other vicissitudes of human existence. Does the Ambition Agreement review come with an extenuating circumstances box? However, if Yarlington’s assessment of the tenant’s progress against their ambition agreement is indeed a factor in deciding whether to grant a further tenancy at the end of the 7 years, this thing is serious. Yarlington’s policy and management of the project may well be open to challenge, potentially under public law (if Weaver v L&Q applies) or possibly via Article 8. In addition, it is not hard to imagine circumstances in which Equality Act 2010 and Article 14 may come into play. Exactly how much of a factor in the decision to offer a further tenancy would living up to your aspirations be? How measured? What is the mechanism for comparison with others on a scale of performance? What specific grades would result in what specific effect on the tenancy review? What if the tenant disagrees with Yarlington’s assessment of their performance? Is there a review process? Would Yarlington be under an obligation to provide reasons for its findings on the tenant’s performance? If you haven’t been the best you can be, but have been quite good at it, on the whole and by and large, would you lose out to someone who has definitely been the best they can be, or possibly better? Is this a perverse incentive to under aspire in the first place, so the targets are easier? Support for tenants to develop, to learn skills and to aid them in management of their household, is undoubtedly a good thing. However, codifying ‘improving your tenants’ into a passive-aggressive housing management scheme, with a very real penalty for the tenant, is unworkable, probably unfair and, I suspect, open to challenge unless very, very carefully thought through. Posted in Assured Shorthold tenancy, assured-tenancy, Housing law - All. ← How Limited is that Partnership? I bet Phyllida Culpin wants her tenants to give 110 percent, no tenancy for those who only give a 100, clearly. some of my clients still insist on cleaning rotas for common stairwells..and insert conditions into tenancy agreements…perfectly enforceable up here in Scotland. Don’t think they insist on smallpox vaccinations though!! i blame that nanny state that our new labour government wants to impose on free people everywhere. wouldn’t get that if the conservatives were in power! 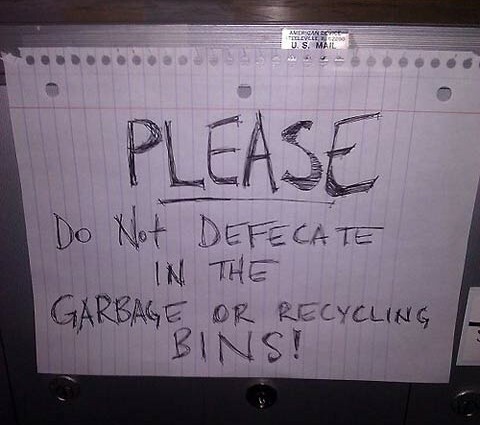 Surely that sign leaves open the option of defecating elsewhere and then transferring it into the garbage or recycling bins. I’m not sure why that should have been thought to be any less unacceptable, but have at it. Easy to mock but, given that RPs will get involved with offering tenant support anyway (but usually on a reactive basis and hence once problems have already started), and can expect to get challenged in court for their (alleged) failure to have engaged with tenants and/or offered support when problems surfaced, are they really to be criticised for trying to work with tenants right out the outset? if RPs do nothing, and simply provide accommodation and not much else, they get attacked; if they try something positive and work with tenants from the beginning they get attacked. Damned if they do and damned if they don’t. It’s easy, as a housing lawyer, to pour over such an initiative and try and tease out precisely how this might go wrong way down the line. Much harder to put yourself in the position of an RP, which (as they all do) want to actually house people, keep them housed, and build communities, and try and put in place initiative for how that might happen. And for the sake of transparency, yes I have worked with YHG and they’re admirable organisation. I think you might have missed the last paragraph. But I have to ask why the RSL or Council? Surely they should be landlords, full stop. Let other agencies get involved for those purposes where people have a need or desire. Private housing estates dont have these initiatives and get along quite well- arguably what a social housing estate needs is policing and repairs and let other groups bid to carry out work and projects. But back in the real world it’s the landlords that end up carrying the can. This is partly because they do have obligations both to `police’ their own tenancies (e.g. for breaches in relation to ASB, noise, discrimination etc) and to take action to protect other residents/neighbours, and partly because as they’re the ones with the direct (contractual) relationship they’re the ones that the `other’ agencies always leave to take action. Ask any ASB officer at an RP how pro-active they think the local Police and/or Social Service are and you’ll get a hollow laugh. The Police will often use the `oh it’ll be quicker if you take action…you’ll get an ASBI quicker then we’ll get an ASBO’ and the SS will cry `lack of resources;. Well that’s not entirely true private estates do have their issues too. Social housing does concentrate societal problems and it is wide church of occupiers. My point is that what resources there are are increasingly diluted and absorbed in overheads of inter agency cooperation and in the case of say Tower Hamlets Homes own scrutiny report on ASB run ineptly and appallingly. The problem is that social housing is asked to ” recycle” the problem people at vast cost, if you enforce a tenancy where do they go? Perhaps in many cases they should fall into hostels and even night shelters for those who refuse to cooperate- the modern poor house. For those who need help there is a problem of resources but leave that to those agencies best able to deal with it and yes there is higher funding issue, but better that than spreading it even further and thinner. Ask the average tenant in an average SH estate and they will tell you the four key problems and that its a tiny minority- better to have that minority ousted if they won’t accept help and the rules. And this is why we have a deficit – paying people to dream up implement and enforce this nonsense. Let alone the court fees when someone challenges it. while I think we do have a need for a modern poor house, why is that poor and unemployed have their right to self determination removed while the rest of us can go to rack and ruin just because we can afford to do so. The Human Rights lawyers will laugh all the way to the bank. LHA – as my post made clear, this doesn’t appear to be a tenancy condition. In fact YHG have said ‘no-one would be evicted’ as a result. However, that is not the same as saying people would not be refused a new tenancy at the end of the 7 year fixed term on the basis of this scheme. We might differ on the need or desirability of a modern poorhouse. You may misunderstand, i was referring to challenging the renewal issue, and of course by implication the underlying qualification criteria for “entitlement” to social housing. Otherwise do you have block A for fatties Block B for the smokers and block C for the healthies? Can they even manage that process of uptake and who takes up the slack?